Do you lay awake in bed for long hours before finally falling asleep? Do you keep worrying about all the problems and stress in your life even while sleeping? Do you wake up even at the slightest noise? Well, if you have experienced all these, then you are certainly among the million others who suffer from troubled sleep. Adulthood comes with many drawbacks with stress and anxiety being its natural consequences. I am sure there are times when you want to go back to your infant days when you can sleep for long hours without any tension and worry. Although, practically, going back to childhood is impossible but luckily, there are ways to ensure sound sleep at night and that’s what I want to discuss in today’s post. 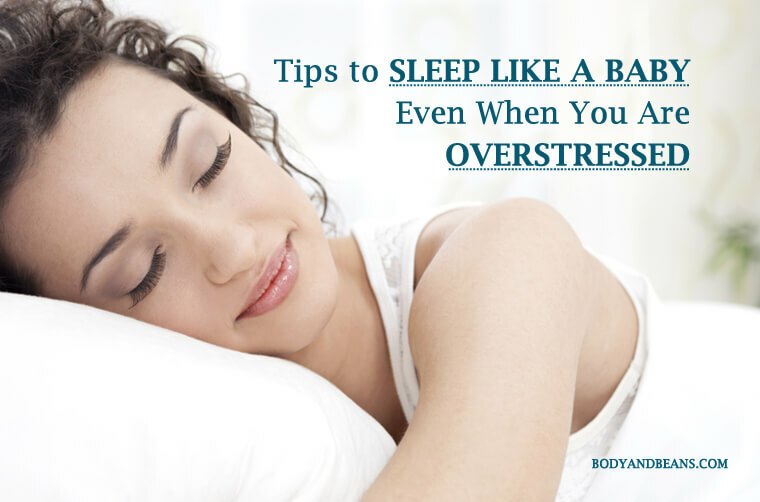 I am going to share with you the extensive list of tricks and tips that will help you to sleep like a baby even when you are overstressed. Having proper night’s sleep is a necessity, as during this time, your body works to support healthy functioning of your brain and maintain good physical health. However, in this hectic lifestyle, most of us are so much bogged down by targets, deadlines, pressure, nervousness that all these seem to haunt us even when we go to bed. Result is inadequate sleep that makes us vulnerable to several health issues. While sometimes, it affects us instantly, at other times it harms us over time by taking a form of a chronic health disease. In fact, not just our physical health, lack of proper sleep can also affect us mentally even, starting from how we feel, react, think, learn and work to the way we get along with others. In short, being sleep deprived can take away the peace from our lives and make us reckless. And if you are unable to get good sound sleep, and wondering about how to get sound sleep like a baby then here’s the post you can’t afford to miss. Now that you have understood how important sleep is for your wellbeing, you need to try to keep yourself calm and stress free as much as possible and I will help you with some of the easiest tips with which you can have sound sleep by getting rid of all your anxiety. I will also tell you few more things about stress and stress management that will help you get sound sleep like a baby. What is stress and why does it keeps you awake at night? Stress is a physical reaction or response to anything that has harmed you in some way or the other. In other words, it is a method, in which your body reacts to a threatening situation. In order to solve the problem, you need to understand this complex mechanism and figure out why it keeps you awake at night. Now, not everyone react to threats in the same way. Some may go to the “fight” mode and feel angry and agitated which may keep them awake nightlong. Others may go to the “flight” mode and feel so low and depressed that, it can affect their night’s sleep. The remaining lot may turn their “freeze” mode on when they simply lay idle without doing anything. This situation will make them ponder over their worries, which will ultimately disrupt their sleep. Therefore, no matter how you react to a particular situation, in most cases it has a strong effect on your mind, which causes hindrance while going to sleep. Stress can affect you at any point but generally during daytime, you are involved in work, so your physical activities help you keep your mental stress away. On the other hand, after the day’s work, when you go to bed at night, you start remembering your stressful situations and ultimately hamper your night’s rest. Night is the time when there is minimal physical activity and hence your mind gets more active and you keep pondering over things all alone. This is what hampers your sleep even if you are damn tired and want to fall asleep quickly. Therefore, you must know how to control your stress and not let it affect your sleep and I will help you do that. How to control stress so that it does not hamper your sleep? Insomnia has hit all of us at some point or the other in our lives. It’s a very genuine concern that needs to be sorted out as early as possible. Most important is the stress management, which must be your primary aim in order to get a sound sleep nightlong. In such case, your mind and thought pattern plays an important role and if you can keep it in control, half your work is done. So follow me as I share with you the simple tricks to control your stress so that it does not hamper your sleep, in six easy steps. Identification of the cause of stress is very important if you want to get rid of the stress. You need to find out what is bothering you and react accordingly. For example, if it is for some upcoming deadline or examination, just keep yourself calm by thinking that you will work a bit more hard during daytime, so that you are fully prepared for the examination or can easily finish your work before deadline. This will make you feel more optimistic. On the other hand, if it is for some other issues like some physical illness or strained relationship, then try to talk about it to close people whom you trust a lot. Sometimes, sharing problems with near ones works wonders in fighting stress. Many people suffer from maladaptive thoughts of sleep where they think sleep to be some kind of danger or threat to them. If you are also among those then please stop nurturing negative thoughts about sleep, as that very thought will not let you sleep properly. Instead, try to think positive about sleep. Think it as something to be very relaxing, enjoying and rejuvenating. According to this paper published on the website of “Mount Holyoke College”, if you can get rid of your negative ideas, and replace those with the positive thoughts, it will generate a positive feeling and let you have a good sleep nightlong. Journaling is a great habit and works efficiently in maximum cases. There are few stressful situations, which you cannot control other than worrying about them. So vent out your stress in paper. Even Silberman, the writer of “The Insomnia Workbook: A Comprehensive Guide to Getting the Sleep You Need” feels that writing down your thoughts and what are you planning to do about it is very important. This practice will give you a feeling of relief that will make you calm. For example, ask yourself whether you are worried about someone else’s action. If this is the problem then answer yourself that it is not your fault and you do not have to suffer for someone else’s faults. However, if you are worried about something very abnormal or hypothetical or unusual, then calm yourself by explaining yourself that the thing is not in your hand, so there is no point in sitting and worrying. Such introspective sessions do work and help you get rid of your stress. If you are determined to solve problems, then it will give you the feeling that you are about to find the solution. You may list out the options that you can do to get rid of the stress. Simply sit and think. For example if you are tensed for examination, then decide that you will probably take your teachers help or consult and strategize your study methods with your batch mate and ultimately rock the exam paper. On the other hand, if you are worried regarding any relationship, then assure yourself that you will talk to that person the next day and solve the issue. After making all these plans, you may finally go to sleep. Remember, if you constantly keep fearing that you are stressed and cannot sleep nightlong, this will even more inhibit you from falling asleep. In fact, think that you are done with the worries and know its solutions, so now you can go to bed and sleep. In other words, your perspective must be that you can sleep without taking the help of a sleeping pill. Keep the fear of not been able to sleep aside when you are going to bed. The act of constantly forcing yourself to sleep will not work. Instead, it will make you more anxious. You must just lie down in bed and just not think much. Keep yourself calm and relaxed and within minutes, you will fall asleep without even realizing that. However, if you still have difficulty and find yourself tossing and turning, then get up, do some relaxation exercises and then go to sleep again. How to sleep like a baby when you are overstressed? In my previous points, I have focused on the mental activities, but now I will share with you some of the important and easy tips where things are more in your control. These methods deal with the physical activities or actions that will help you get sound sleep like a baby. Proper sleep routine is very essential if you want to stay healthy and get a good night’s sleep. By sleep routine, I meant a fixed sleeping and waking time that you must follow even in weekends and holidays. This practice helps you to quickly fall asleep even if you are overstressed. Try to allot 7-9 hours to sleep which is considered ideal for the adults. The proper sleeping pattern will make your mind and body accustomed to that routine and hence you will automatically feel sleepy during that time. This is another important thing that you must focus on. Try to relax yourself 1-2 hours before finally going to bed. You may read some story books, listen to soft music, do some gentle yoga or talk to loved ones. Then you can dim the lights and slow things down as much as possible. In other words, these methods will make your body and mind ready to finally calm down and relax. Therefore, things or activities that excite you a lot or make you stressed must be avoided during that time. 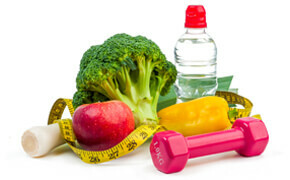 Regular exercise is the key to healthy living. It not just helps you fight various diseases and remain fit but is also very efficient in promoting sleep. In fact, it is probably the safest and the most inexpensive way to battle the problem of stress and its effects on sleep. You must aim for exercising on a regular basis for minimum 30 minutes. You may take a brisk walk before finally going to bed. This will help the food to get digested properly and also prepare yourself for a good night nap. However, exercise at least 2 hours before sleeping otherwise it may take a reverse effect. Going to sleep with a full stomach is not a good option as it can keep you awake for several hours. This is because the food particles are not digested and can give you an uncomfortable sensation that in turn disrupts your night sleep. If you get hungry before going to bed, then have some light snacks and avoid eating anything heavy. Dinner is very important for getting a good night’s sleep. Foods containing magnesium, tryptophan and melatonin promotes sleep and hence are ideal for dinner. You may also eat meals with a combination of carbohydrates and proteins. Often a dish of quinoa with sliced chicken breasts sprinkled with pumpkin seeds and sautéed greens works wonders. In fact, a bowl of frozen yogurt made with coconut milk and berries is great for inducing perfect night sleep. However, try to avoid too much hot, oily spicy stuff as they may affect your sleep. A cup of tea is just perfect before you go to bed. In fact, to be more specific, a cup of herbal tea is a great way to wind up your day before finally going to sleep. Drinking herbal tea induces sleep and relaxes your body after a tiring day. Choose a tea that does not contain caffeine. In fact, chamomile tea is a very good option to fight anxiety and insomnia as also accepted by the “University of Maryland Medical Center”. However, you must avoid it during pregnancy and if you are allergic to ragweed and daisies. The effect of caffeine in human body generally varies from person to person but in most cases it interferes with your night sleep if taken late in the evening. Caffeine stays in body for minimum 8 hours and hence you must restrict your intake of coffee or other sources of caffeine like black tea, hot cocoa etc from the evening. Even the doctors from the “Cleveland Clinic” recommend caffeine intake by 2pm especially for people who have difficulty in sleeping. Therefore, try drinking coffee only in the mornings or at noon. A night bath before finally going to bed is a perfect method of calming and cooling you down after a hectic day. You may mix bit of Epsom salt and few drops of lavender oil in warm water and then take a bath. If you are not too much prone to cold, you may even allow the water to soak for around 15 minutes. This will let the magnesium content in the salt to get absorbed by your skin and facilitate relaxation feelings. The combination of the water and salt cleanses all the day’s energy and makes you fall asleep faster. Generally, a night’s sleep means temporarily cutting yourself off from the rest of your surroundings and for that feel to come, lights and sound play a very important role. In most cases, a pitch-dark room away from any kind of noise is ideal to induce sleep. For that, you may take the help of eye mask and earplugs. Nevertheless, if you are afraid of too much of darkness, you may keep your dim lights on. Also, if you are among those who feel more relaxed and calm when soft background music plays on, then you may apply this technique while going to sleep as well. So choose your comfort zone and accordingly arrange things before going to sleep. According to “U.S National Library of Medicine” there are various relaxation techniques, which promote sleep. You may take the help of acupressure mat. Lay down on it before finally dozing off. In fact, you may opt for many other relaxation methods. For some, the progressive muscle relaxation or video on yoga nidra works in which the body parts relax with the help of mind while others get immense benefit with acupuncture. This practice is also very important as far as having a perfect night sleep is concerned. Here you have to breathe only through your left nostril by blocking the right one with your right hand. This activity induces sleep and gives a relaxing and soothing feel to your body. In fact, in Kundalini Yoga, it is said that if you can take 26 long, deep and slow breaths in this pattern, your whole body and mind will relax and make you stress free. Most of us feel sleepy at the afternoon especially just after lunch. However, you must avoid that at any cost. Simply lying down or a nap for 30 minutes will not affect much, but long naps till late in the afternoon may hamper your night’s sleep. In fact, if you sleep too deeply in the afternoon, it is often not a good feeling. It sometimes gives a lazy and fatigue feeling for the rest of the day. Smoking is injurious to health and can interfere with your sleep. Nicotine is a stimulant and can keep you awake till late at night. So try to completely quit it as early as possible. But if you are unable to completely get rid of it, then try to limit the number of cigarettes few hours before you go to sleep. According to “National Sleep Foundation”, if you want to have a sound sleep, make your sleeping environment comfortable. Choose the right cozy bed or mattress together with soft cushions and keep your bedroom cool. Wear something comfortable and light so that it does not hinder your sleep. Also, make sure your bedroom remains airy and spacious as stuffy rooms can give you a choking sensation. While going to sleep make sure you perform bedroom activities only for example intimacy where the mind can associate the bedroom with relaxation, love and comfort. Avoid watching television while lying in bed and keep your mobile away. If you have pets, avoid sleeping with them. Instead, make a separate place for them to sleep. For many, aromatherapy works and it is advisable you also try it out once. Some scents like lavender and chamomile promote sleep and give a relaxing sensation. You may try out by spraying a bit on your pillow or keep a sachet under your cushion or pillow to see whether it works in your case. Many people have this habit of watching the time tick, which in turn hampers their sleep. It causes more stress as you are constantly reminded that you have to get up in the morning and start another hectic day. So put the alarm clock away or cover it while going to sleep. Sleep is really very important for our wellbeing. An adult needs minimum 7 hours of sleep to remain energized throughout the day. However, our sleep process is often affected by stress and anxiety and that may lead to insomniac tendencies. This problem is very common in today’s lifestyle and considering its seriousness, I have jotted down some of the easiest tips to manage stress and have sound sleep at night like a baby. Some ways include controlling your mind, which is the difficult part but if you can apply those techniques in real, then nothing can stop you from having a good sound sleep. Other tips include changes in your habits, doing regular exercises, creating proper sleeping environment etc. These are not that tough and can be easily followed by you. You just have to patiently follow my instructions and enjoy the positive results. However, if none of the above methods work for you, then it is best to consult a counselor or doctor and take medical help. Do you have problem while sleeping? Have you tried any of the techniques discussed above to get better sleep? Well read the list and share me the feedback in comments below. Do spread the word among the other people and also feel free to share your tricks and hacks that help you get sound sleep like babies. Until then, stay calm and enjoy the perfect night sleep.